Anzac Day – April 25 | Turning my world upside down! On the occasion of Anzac Day 2015, I wanted to reblog this post from 2011. 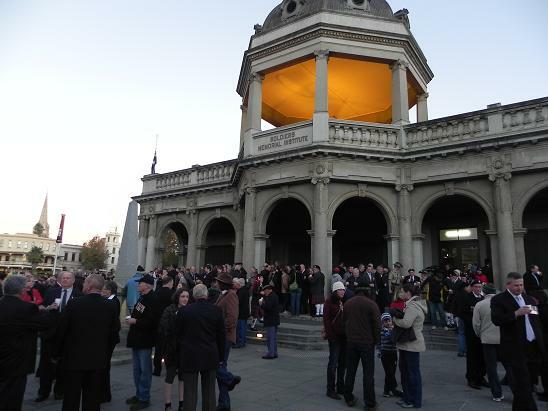 To all my Aussie mates, I can’t begin to tell you how impressed I was with the dawn service in Bendigo. I don’t think we have anything like that here in Ottawa. 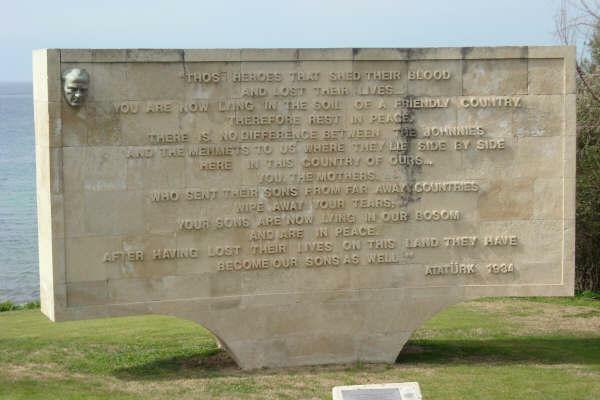 It was simply haunting, as are the words of Ataturk on the plaque we photographed during our 2009 tour of Gallipoli, Turkey. We had the best intentions. We went to bed at 8:30pm and set the alarm for 2am. Unfortunately, my stomach had different ideas and kept me awake the whole night. 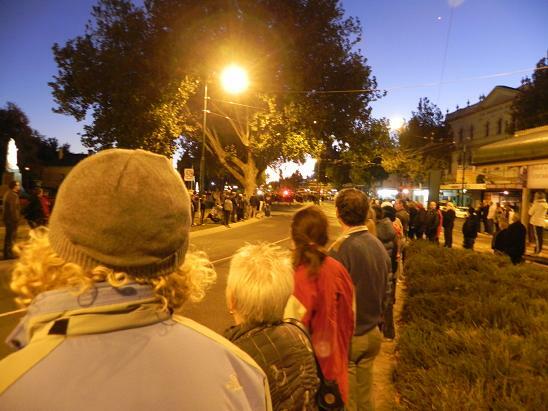 So at 2am, having had maybe 10 minutes of sleep, I agreed with Leon that going to the local Anzac dawn service would be more reasonable. We got to the city core in time to see the crowds gather and line the streets of the procession. It was a simple service. First the pipes and drums arrived leading the way for the veterans. In Australia, people who have ancestors who have served are allowed to wear their medals and march in the procession as well. 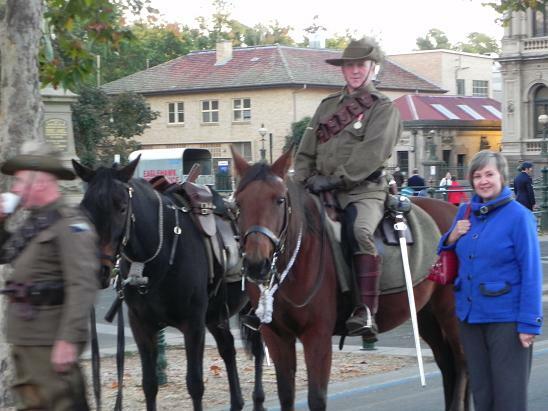 The 2 horsemen from the Australia Light Horse closed up the ranks as they proceeded from the Soldiers Memorial to the Cenotaph. After a brief ceremony, we walked towards the Soldiers Memorial where we were offered a sausage on bread and a coffee with a shot of rum. Pretty hardy breakfast at 7 in the morning! I did not partake. However, I did stop and speak to the nice rider and his horse. After that, it was back to bed for me to recapture some of the lost zeds. There are a great number of shows on TV capturing the Anzac services in Melbourne and even one that is broadcasting live from Gallipoli, Turkey. I am glad we visited the Soldiers Memorial in that country on our visit 2 yrs ago. We were very touched by the tribute written by the Turks to the Anzacs. So, all in all, Anzac Day is a very solemn affair. Many Anzac troops died in WW1 and they are honored in this way each year. I can’t think of any similar occasion in Canada where we rise before dawn to remember our servicemen and servicewomen. The service is held at dawn because that’s when the landing on the beaches began. I would love to go to Gallipoli one day and pay my respects. We were very moved by the tribute when we saw it in Gallipoli. It was surreal for us to be there. We had seen the Dawn Service at Gallipoli shown on TV and had learnt about the historical significance through school so being there was such a humbling experience for us.